Try to get a hole in one by adjusting the velocity and launch angle of a golf ball. Explore the physics of projectile motion in a frictional or ideal setting. Horizontal and vertical velocity vectors can be displayed, as well as the path of the ball. The height of the golfer and the force of gravity are also adjustable. This has be broken down to focus on vecolity and acelleration vetors, along with angle manipulation resul... (more)ts. No math. Students complete prior to class as part of their "flipped" classroom experience. This lesson uses the original Explorer Guide that has been reformatted to better break out the instructio... (more)ns from the questions and provides students space to make their answers. Used this with both Honors and AP Physics. Great Visual and Instant feedback after calculations are completed. Excellent learning tool for projectile motion. 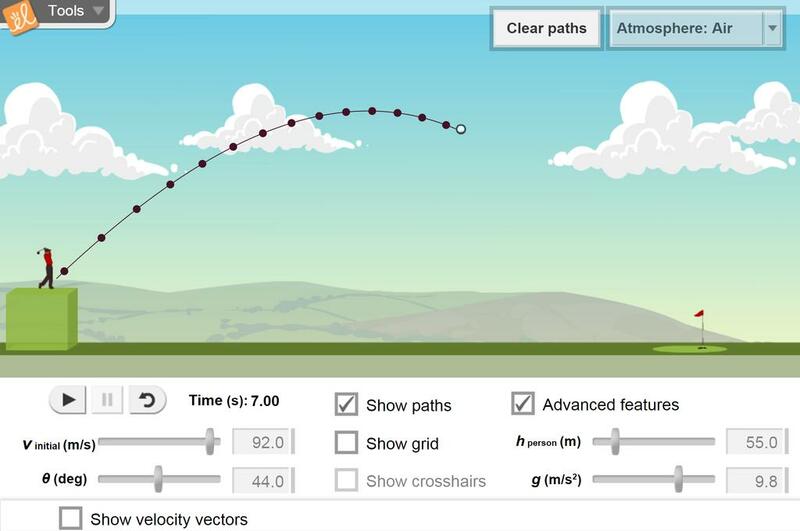 An engaging look at projectile motion and a great visual for vectors. And it's fun. Use the advanced features, turning off air friction to teach x & y components of velocity.